The Poodle is exceptionally smart, active and excels in obedience training. An outgoing breed, the three Poodle sizes have been used to work with humans in various capacities, including as a water retriever, truffle hunting and performances in circuses, where their friendly nature has been a plus. The breed comes in three size varieties, which may contribute to why Poodle is currently the 8th most popular breeds according to AKC® Registration statistics. The varieties Standard, Miniature, and Toy are used to describe size only. All the Poodles are one breed, governed by the same standard. Moyen is the French word for the fourth size of Poodle in France, but everyone else in Europe refers to them as Kleins (meaning small or mini in German). Their size is between 15" and 20" tall at the highest point of the shoulders. The Moyen/Klein is not an officially-recognized size in AKC. While the Poodle Club of America/AKC doesn’t recognize the Moyen or Klein size of Poodle, they are becoming quite popular! We love them at Idaho Jewels....we think their size makes them perfect for active families and smaller living spaces! Most of our moyen/klein-sized poodles are the result of inter-variety breedings, which infuse important diversity into the lines! 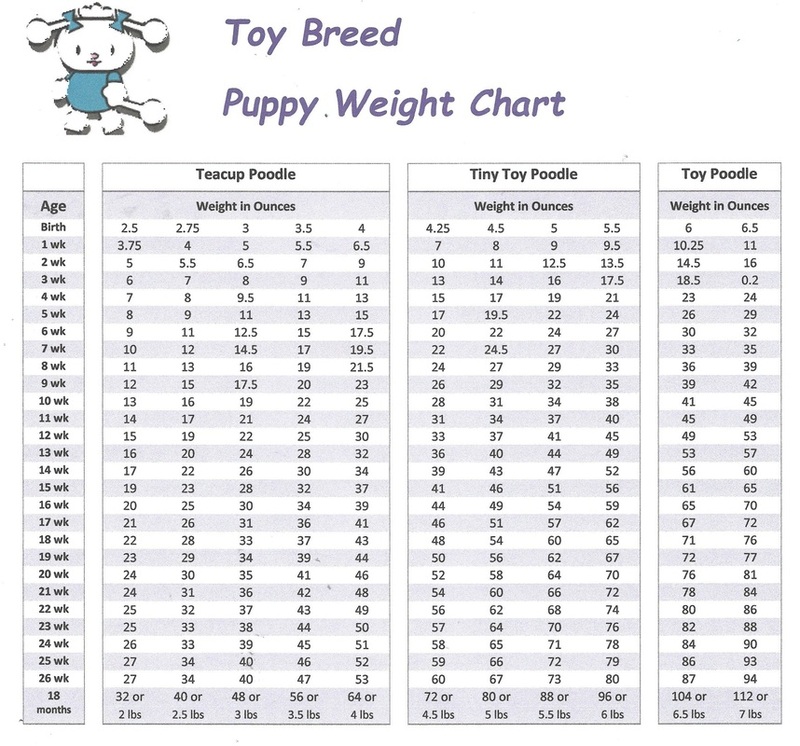 The weight chart below is a general guide for estimating adult weights for our toy poodles. There is a lot more information and guidance that goes into estimating adult weights such as sizes of ancestors, nutrition, past litter history. We do our very best to estimate the adult size of the puppies. No one can 100% predict the adult size of a puppy...genetics is very complicated! Small breed dogs are typically about done with their growth at about 6 months of age, although they may "fill out" just a bit more. Dogs--like people--also gain some weight as they mature and certainly will gain weight after spay/neuter. This is a growth weight chart that has been around for a very long time and can use used as a guideline for "charting" a puppy's adult growth. This chart is certainly not meant to be the only use in helping one estimate adult weight as there are many other factors to consider, i.e. mom & dad's size & sizes of their ancestors, past litter history, nutrition, etc.